Do you remember back in June this year Nvidia announcing that new more affordable wired 3D Vision active shutter glasses are coming? Well, if you live in the US you are able to get these cheaper wired 3D Vision glasses for a while now for $99 USD, however if you live in Europe, where there are a lot of more price-oriented markets, you are still out of luck. It appears that the wired version of the 3D Vision active shutter glasses is still yet to reach Europe and most likely other markets as well. I did manage to spot some places offering the glasses, but only in Germany and even there it isn’t easy to get a hold of them, and as expected the price in Europe is translated to 99 Euro. So it seems that we are going to have to wait a bit more for the wired version of the 3D Vision glasses to become widely available in Europe. And until then you’ll have to wait for a review of the glasses comparing them to the already available for a while and more expensive wireless counterpart. Last year, when the first HDMI 1.4-capable 3D HDTVs from Panasonic started appearing on the market, the Japanese company did not have the best active shutter glasses available, but they are constantly improving on that. 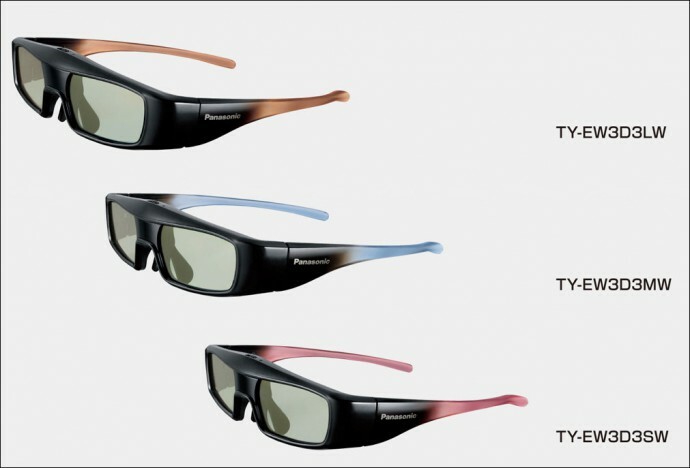 The second generation of active shutter glasses brought some of the needed improvements and now we are about to see the third generation of Panasonic active shutter glasses for their 3D HDTVs, namely the TY-EW3D3 series, expected to be available this September. The new glasses should be available in three sizes (small, medium and large) with a different product name for each, respectively TY-EW3D3SW, TY-EW3D3MW and TY-EW3D3LW (S, M and L). The small and medium models have a weight of just 26 grams and the medium will be one gram more at 27 grams, so you can expect these do be very lightweight. 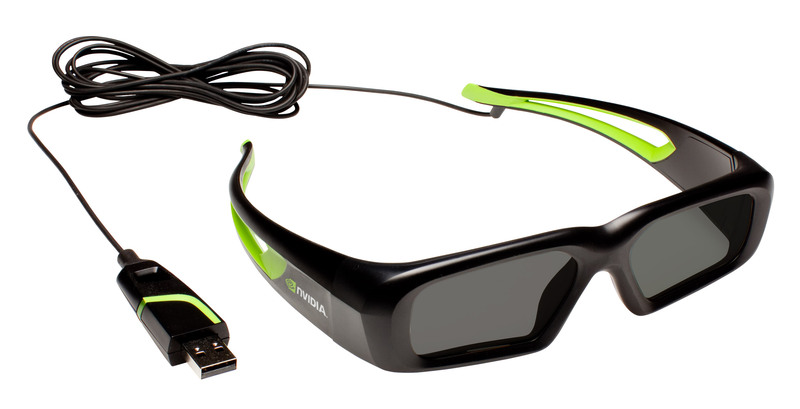 The glasses come with a built-in rechargeable battery that should provide you with up to 25 hours of continuous use with a full charge that is taking approximately 30 minutes, and there is a quick charge functionality built-in that can be quite handy. With just a two minute quick charge you can get up to 3 hours of use, so you can easily watch a whole movie in 3D even if you forgot to charge your glasses and they got discharged. But the most interesting new feature built into the new TY-EW3D3 shutter glasses from Panasonic is the 2D mode that allows you to switch the glasses into a special mode showing you the 2D version of a 3D movie being played on the 3D HDTV. This is done by activating both shutters of the glasses to show you only the frame intended for the left eye, so that you see only the left eye image in both your eyes and the result is that you get to watch the movie in 2D. I’ve already demonstrated how this is possible with a pair of Nvidia 3D Vision shutter glasses a while ago and that it actually works quite well, but then again this solution also opens other possibilities like screen sharing in 2D mode for example. The new active shutter glasses should also offer a 10% better improvement in terms of image brightness, meaning that the lenses of the glasses will block less light as compared to the previous models. It is interesting to note that the new Panasonic active shutter glasses are the first using the new M-3DI standard announced by the company not too long ago, so in theory they may be able to work with other non-Panasonic 3D hardware if any other company produces compatible devices with this new standard. Of course these glasses are not going to replace the wireless models, they are just going to go along with them for people that don’t mind wearing glasses that are wired to the PC, wanting more affordable solution (the wireless IR 3D Vision kit now costs $149 USD after the recent adjustment of the price from $199 USD). The wired 3D Vision glasses seem to be a great solution for work environments where you have multiple systems using 3D Vision or for LAN parties for example, not that you cannot also use them at home, but with the recent wave of 3D laptops and 3D monitors with integrated IR emitters for personal use you might just want to get an extra infrared wireless pair of glasses only for $99 USD . The new wired 3D Vision active shutter glasses use the same shutters and are compatible with the same hardware as the wireless glasses (there seem to be just some design improvements implemented in the frames) and I suppose you should not have any trouble using them both at the same time on one system (this needs to be confirmed). Of course there should be an official driver update to add the support for the wired 3D glasses as well, so we should be getting that probably in the next WHQL driver sometime in June. The new wired 3D glasses are going to be coming with 10 foot long USB cable (around 3 meters) that should be enough to cover the need of most people using a 3D monitor, although the length of the cable might be a bit of a problem for people using 3D DLP projector setups, so for that the wireless glasses might still be a better and more flexible choice. And I hope to soon be able to try a pair of the new wired 3D Vision shutter glasses and report back, although I’m expecting no surprises here, especially considering the LC shutters and the electronics driving them should be performing pretty much the same as on the wireless version.